Right from the outset, GM Global Solutions has been an industry pioneer, offering customers a remote control program for their fleets of machines. The system offers the possibility of entering, editing and managing different machine models in heterogeneous fleets. The stock control can be configured and optimised according to different criteria: sales, routes, rounded units, etc. and the system proposes replenishments based on the criterion selected. Thanks to the GMBOS, product prices are remotely updated on an ongoing basis. The system offers the possibility of configuring each machine, either on a one-by-one basis or in groups. The customer can configure different types of alerts: operational, inactivity, technical status, monetary status, and stock. GMBOS offers different types of reports (sales and missed sales opportunities, monetary status reports, cash-up reports, etc. ), which are all extremely useful for the management of the fleet of machines. The system allows customers to create subordinate users, who are solely granted the permits required for management. The advertising manager can be used to generate a play list (photos and videos) and to program the times at which each play list is to be played. BILLING MODULEGMBOS offers a billing module for customers, making it possible to manage delivery notes and invoices, this is an extremely simple operation with no need for additional management software. GMBOS offers integration tools for POS and ERP external software developers. 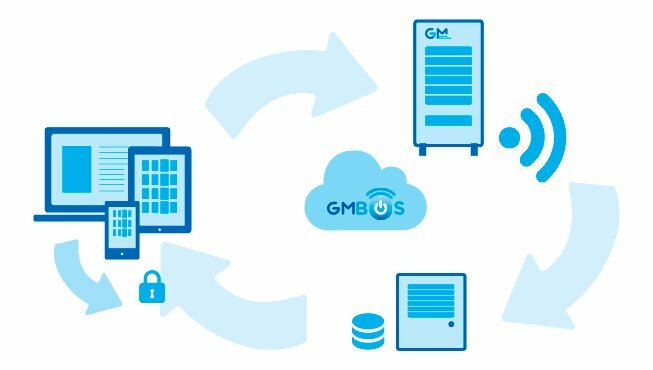 GMBOS IS A COMMUNICATION AND MANAGEMENT SYSTEM that is applicable to a whole range of sectors: VENDING, RETAIL, CONVENIENCE STORES, PPE, PHARMACY AND PARAPHARMACY, COFFEE, etc.